Engineered to be highly durable while remaining lightweight and comfortable, the Fast-Tac TDU® Long Sleeve Shirt is the newest in innovation from 5.11®. We used lightweight 4.7 oz Fast Tac polyester fabric for a breathable look and feel, and added a C6 water resistant finish for extra protection in arid climates. The Fast-Tac TDU® Shirt has double elbows for durability, pen guides on the chest pockets, and a pen pocket on the left sleeve. 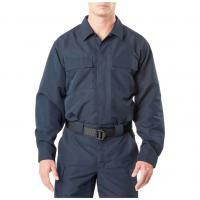 Badge and epaulette kit included for uniform wear. Rugged, lightweight value.